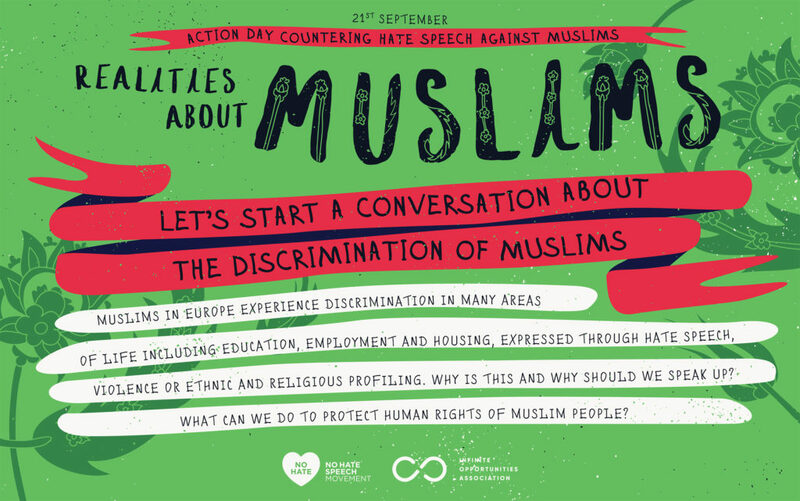 In this Google Folder you find templates for developing your own conversation cards or posters that challenge Myths and stereotypes that fuel hate speech against Muslims. Three examples are provided in the drive, see one of them below. You can insert any topic that you find relevant to reflect on with others through a group discussion in an activity or on a online discussion board or platform. Be careful about wording so you do not reinforce the stereotypes, instead raise a question, why is it? How does this affect our enjoyment of our human rights and democracy for example or what can we do to promote Human Rights of all. How can I make my conversation cards? The drive provides you templates for creating your own cards. You can use Adobe Illustrator or any other graphic editor that can process .ai files. The drive also provides the fonts used in the template. You can also translate the existing examples into your language and share it on your social media to invite people to think and comment.